UK Poker News was pleased to sit down this week with one of the UK's legendary names in poker, someone who has been around the scene since the 1960's and isn't finished yet! 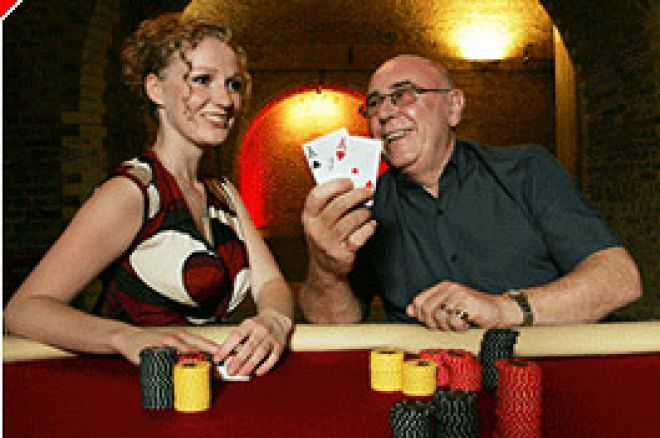 Roy Houghton has been involved in the running of casinos and card rooms in London and Brighton and been at the heart of an awful lot more including the conception of some of poker's great ideas that we take for granted today. Now, he is on the verge of opening a brand new private members club, "Loose Cannon Sports Bar &amp; The VC Player's Lounge", in the City of London, under the classical Victorian railway arches of Cannon Street station (For contact details, click on the News tab above for our article dated Saturday 9th September). Those who know Roy know a Londoner in the classic mould, a man with plenty to say and a cockney wit to tell it with. In this, the first of a two part feature, Roy talks in his own inimitable style about the early days of his career in the gaming industry. In part two, Roy brings us up to date including his time spent pioneering big poker tournaments in the UK and having a key role in the conception of the Ladbrokes Poker Million and the Gutshot Club, plus the long road to open his new club. Well, basically, how old was I? About 25 and I wanted to emigrate to Canada. I'd had an unhappy marriage, I was divorced and ****ed off with people generally so I thought I'd emigrate. I was a sales rep at the time but when you're 25, you like going out a lot, don't you, so I didn't save any money! So, I was going to emigrate with a friend of mine and he went "How are we going to save the money to get to Canada? We'll have to get a part-time night job". Hence the casino business! I went down to the Golden Nugget for an interview, got chosen and was trained as a dice dealer. I went over to the Craywood Club in Streatham – long since closed now – and became a dice dealer there. I was only there three or four months when the manager came up and said "Look, there's a group of people here who want to play poker; does anyone deal poker? "; "No"; "Anyone want to deal poker? "; "Yeah, I'll give it a go!" So, they sent a Chinese lad from the Golden Nugget; I think there was about five of us put our names down, and he started training the five of us up. I didn't find it particularly hard but the others couldn't get on with it, couldn't grasp it. To cut a long story short, I ended up becoming the resident poker dealer. I then went down to Brighton one weekend, took a young lady down with me. In those days there was what was called the Clubman's Club. It was a club you belonged to and you were automatically a member of about 300 clubs, you know, and it told you whether it had a casino. So, I took this young lady down to Brighton, looked in the Clubman's Club and thought, "Oh yeah, here's a club with a casino, we'll go in there." Absolutely dead it was; got about three people in there; great big bar. So, it was the governor behind the bar and I said "it's a bit quiet in here". He said "Well, I've only just taken it over." I said, "have you got a casino?" He said, "yeah, it's on the first floor." I went up there and it was another massive room with one French roulette table stuck in the corner! I had a little punt, then came down – chat, chat, chat! – I said "Look, you've got all that room upstairs all going to waste; if I put a dice table upstairs, how much would you charge me?" "Tenner a week" he says. "Leave it out, leave it out! Ten pound a week, that's a fortune." Anyway, tenner a week it was; I bought a dice table and had it shipped down to Brighton. The guy rang me up and says "You were serious weren't you? I've just had a dice table delivered!". I said, "Yeah, I know". "I thought it was general talk.". Basically, what had happened was that we had saved the money to go to Canada but my friend, bless him – and he's still a very dear friend now – had had cancer, testicular cancer, and they wouldn't give him a clean bill of health and couldn't get a permit to go. I had got one and I thought, well I don't really fancy going out there on my own so it all sort of died a death. So, the guy in Brighton said to me, if you are going to have a dice table, can you get some more gear, you know like American roulette tables, blackjack and so on, and make a proper casino out of it? I got a few staff in, bought the tables. We opened up and we just went from there to there (points upward!). It took off, this place, it was fantastic. Now Dickie, the owner, he then built a disco in the basement, Tinkerbell's, and soon the money was pouring in, so after about nine months, he came up to me and said, "Do you want to take over the whole casino?" I said "No, I haven't got any money." He said "Well, I'm too busy now with the disco, and this and that; £500 a week and you can take over the whole casino." I bought two friends in and we all had a third each in the casino. This went on until 1970. Just to give you an idea of how bad things were, we lost our gaming licence in 1970 because the residents had drummed up an Act that the Prince Regent had passed! They drummed up this bleeding law that was hundreds of years old that said that no business could be carried on in Brunswick Square! The Judge upheld it but said he had a lot of sympathy with us. We said, there's a load of hotels here too but he said they were not objecting to the hotels, they're objecting to your club! It's still on the statute book and still an Act of Parliament today. The Judge said he couldn't give us the licence. When we lost the licence, my French partner had a villa out in Majorca with its own swimming pool. Australian George owned five houses in Brighton that he sub-let to Sussex University. That's how much money they made out of it. What did I have? £700 worth of debts! I gambled, I played a lot of poker; not well I might add, as you no doubt gathered! So, we lost the licence and I went out of the business. Then in 1974, I thought I would go back into it. The Vic (Victoria Casino) were advertising for poker dealers so I went there, had a table test, got the job. I was there from 1974 to 1982 as a dealer. They closed the card room in '82. They lost a lot of money in the Claremont and the company panicked. They closed the card room down and made us all redundant. I took the club to the industrial tribunal and won my case so I thought they were never going to ring me up again! Would you believe it, sixteen months later, the manager rung me up; "Roy, will you come and reopen the card room?" "Why?" "Well, we're losing a lot of money." So, we were back and now I was card room manager. I was the first person to run a poker tournament in the UK; that was 1982. Then, as is always the case, managers get moved around. One person might come along, 100% in favour of poker. Then another person takes over as manager, can't stand poker, doesn't know the game, doesn't want it; a disaster. So, you've got a card room always alternating between empty and very busy depending on the manager's whim and it used to drive me mad! So that's exactly what happened at the Vic. We reopened the club in 1984. Bookmark this site to catch Part 2 of this fascinating tour of Roy Houghton's poker career in his own words, and how he ended up opening The Loose Cannon! Ed note: There's a whopping $500 bonus to be had when you download VC Poker right here!